Orthodontic problems can affect both children and adults — even those who wore braces when they were young. That's because teeth are more mobile than you might think. 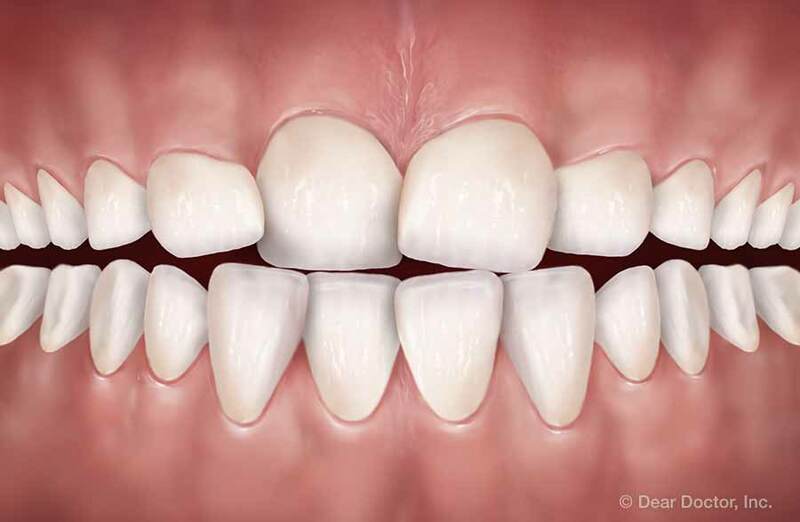 In fact, teeth move very gradually all the time in response to the normal forces of biting and chewing. But the teeth can also be pushed out of proper alignment when, for example, young children develop unhealthy habits such as thumb sucking or tongue thrusting. These and other orthodontic problems usually become apparent around age 7, when the permanent teeth have started to come in. That's why an orthodontic evaluation is recommended for all kids at this age. Adults often see their teeth begin to crowd toward the center of the mouth. Your bite may also shift into poor alignment due to a missing tooth. But it's good to know that no matter what your age, orthodontic treatment is available for all of the common orthodontic problems listed below — provided your teeth and gums are healthy. It's also important to remember that wearing a retainer after any orthodontic treatment will help preserve the results for as long as possible. Abnormal eruption is when a tooth emerges through the gum in the wrong place. 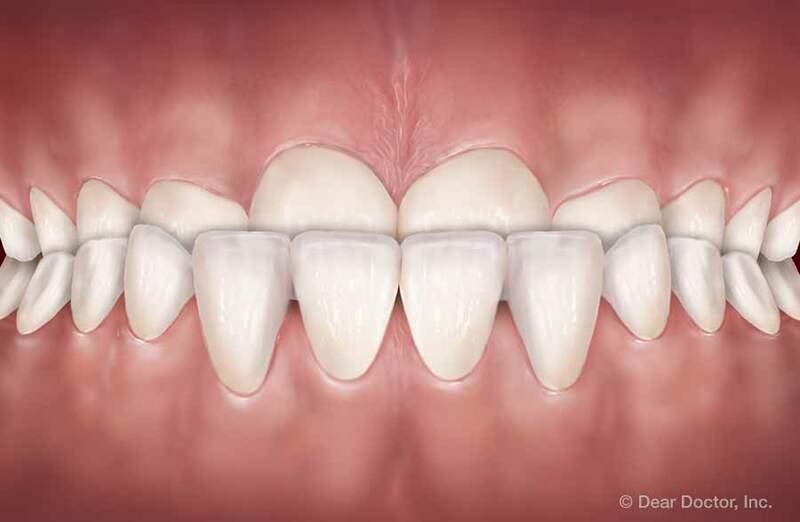 If the tooth is blocked from growing in fully (a situation called impaction), a minor oral surgical procedure may be required to uncover the tooth before orthodontic treatment begins. Crossbite is when one or more of the upper teeth bite inside the lower teeth rather than outside. 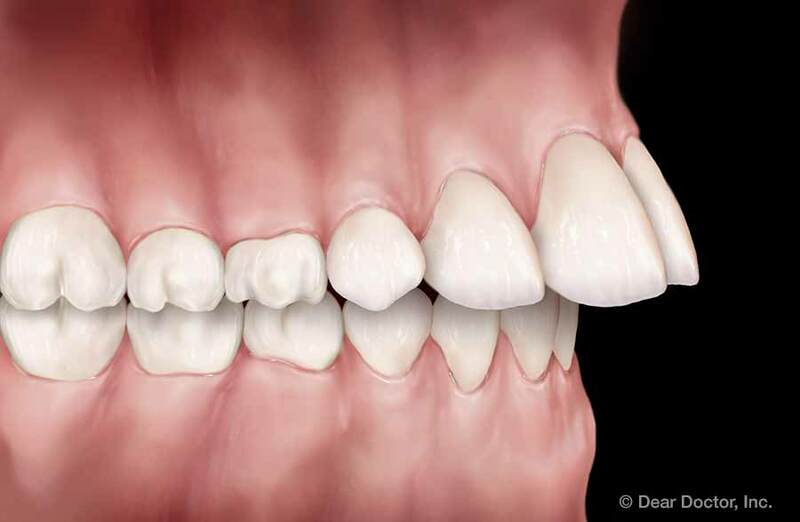 This is usually related to misalignment of the upper and lower jaws. In a child who is still growing, widening the upper jaw with an orthodontic appliance called a palatal expander may solve the problem. 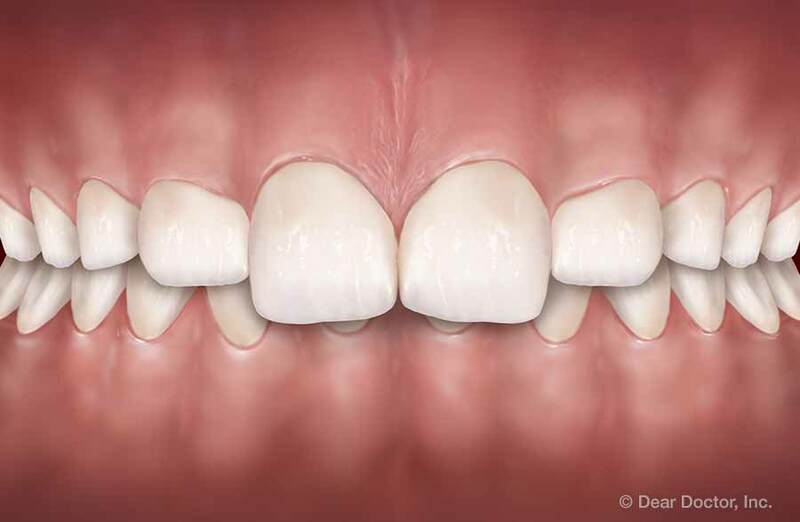 Crowding results from a lack of space for the teeth to fit normally within the jaws, either because the teeth are too big or the jaws are too small. Possible solutions may include removing some teeth and/or making more room in the jaws with a palatal expander or through a surgical procedure. 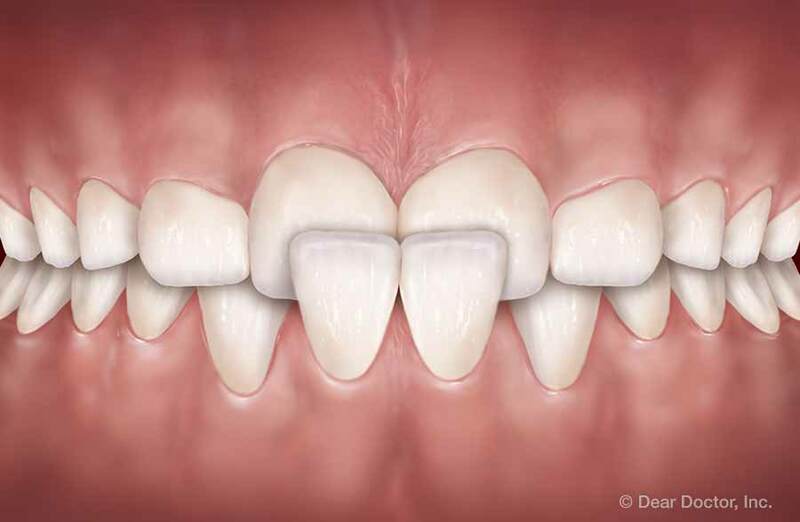 Excessive spacing may result when one or more teeth fail to grow in, are lost to trauma or disease, or there is a discrepancy between jaw size and tooth size. 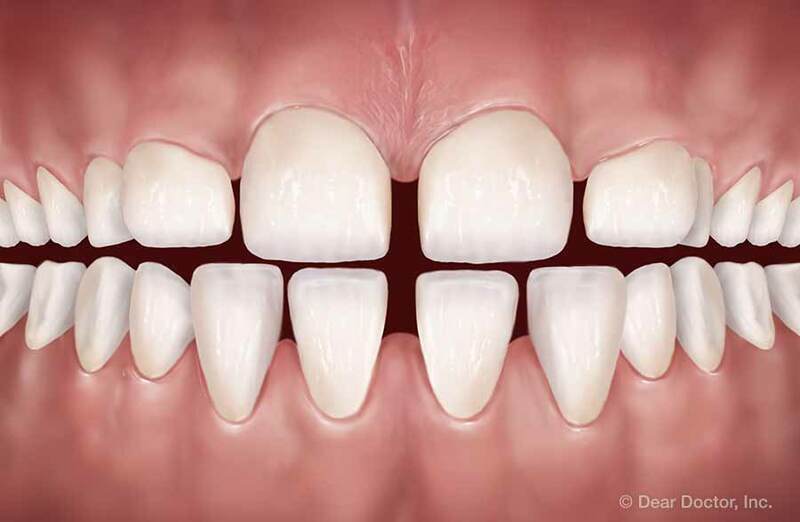 It's important to close the gaps because excessive space allows nearby teeth to shift out of position. Open bite occurs when the upper and lower front teeth do not come together when biting, resulting in an open space between the two. This is often the result of tongue thrusting (also called infantile swallowing pattern) and/or prolonged thumb sucking. Overbite (deep bite) is when the upper front teeth bite too far down over the lower teeth. 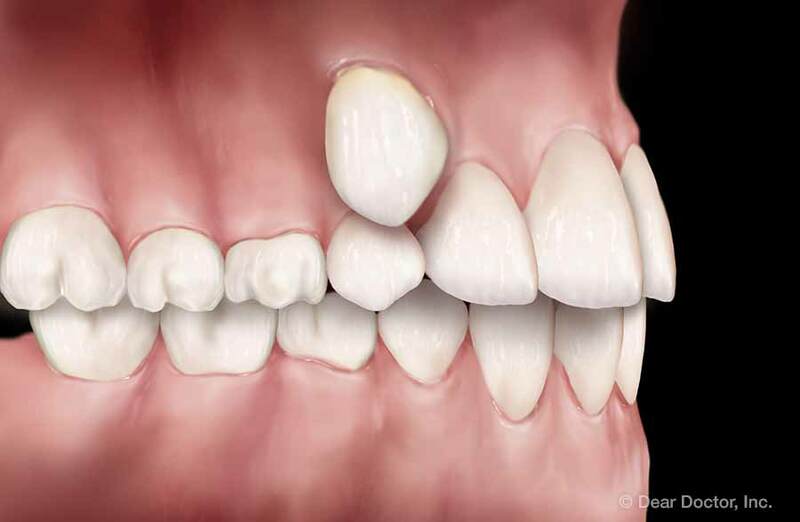 Sometimes the bite is so deep that the upper teeth cover the lower teeth completely, forcing the lower teeth to bite into the roof of the mouth (palate). This often results from a discrepancy in jaw size. 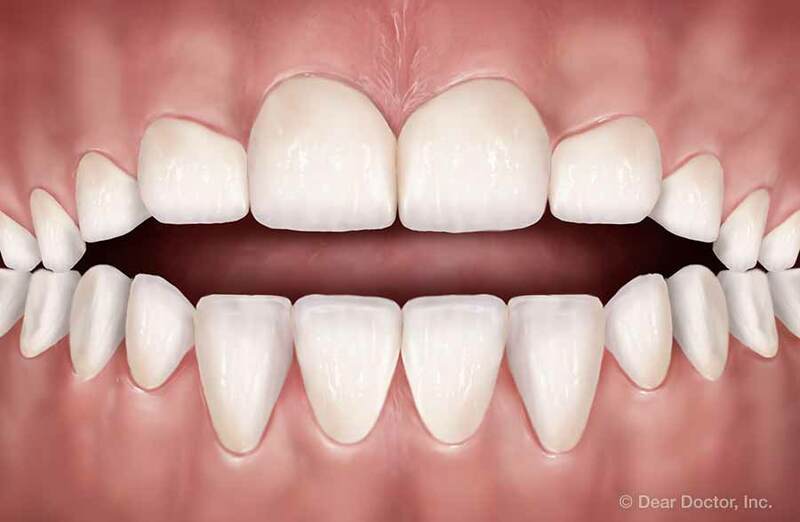 Overjet (protrusion) is when the upper front teeth extend too far forward or the lower teeth don't extend far enough forward. This may be related to genetics, improper jaw development, missing lower teeth and/or improper alignment of molars. Thumb sucking or tongue thrusting can exacerbate the problem. Underbite occurs when the lower front teeth extend past the upper front teeth. It can be caused by overgrowth of the lower jaw and/or undergrowth of the upper jaw. Depending on the severity, treatment may involve conventional orthodontics and/or jaw (orthognathic) surgery. If you are concerned about the alignment of your teeth, or your children's teeth, please schedule a consultation at the dental office. We would be happy to advise you about your treatment options.